The Iskusstv Square of St. Petersburg, the original name of Mikhailovskaya Square, is an architectural ensemble designed by the great architect Carlo Rossi in the first half of the 19th century. The buildings of the Mikhailovsky Palace and the Mikhailovsky Theater, the Golenishchev-Kutuzov House, the Musical Comedy Theater, the Russian Ethnographic Museum, the Bolshoy Hall of the Philharmonia named after D.D. Shostakovich and the hotel "Europe". Of course, not all the buildings of the square were created with the participation of Rossi, but, building up the square, other architects used his projects or imitated the style of the facades of their buildings. The beginning of the unique appearance of the square was laid by the construction of the Mikhailovsky Palace, where today the State Russian Museum is located. 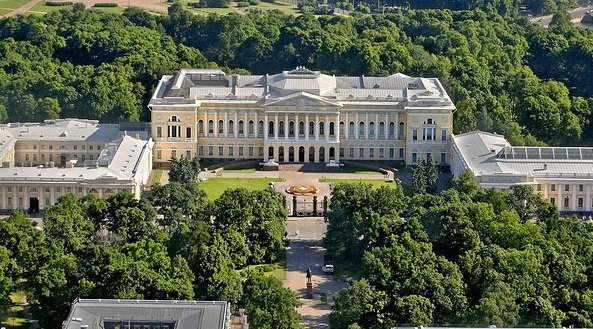 On the project of the residence of Prince Mikhail Pavlovich since 1817 the architect Carl Rossi worked, and the idea of ​​construction belonged to the father of the Grand Duke, Emperor Paul I. However, the project was launched only after the death of the monarch. The place was chosen for a long time and finally settled on the overgrown wasteland in the center of the city, in the northern part of which was located the orchard founded by Peter the Great (Third Summer). Rossi has set himself the grandiose task of creating a new urban ensemble in the classical style, having planned an area and two new streets named Engineering and Mikhailovskaya. The architect also designed all the facades of the buildings that came out onto the square, although they were later built by other architects. The radical re-planning of the vast territory, previously only partially built by wooden greenhouses and household buildings of the Third Letniy Garden, allowed Rossi to connect the new Mikhailovskaya street in front of the Mikhailovsky Palace with the central thoroughfare of the city - Nevsky Prospekt. As a result, a view of the palace façade with an elegant eight-column portico of the Corinthian order was opened. The architect conducted the project extremely carefully, working through the sketches all the details, from the cast-iron lattice and the layout of the park to the drawing on the floor in the halls of the palace. The construction of the Mikhailovsky Palace lasted until 1823, and two years later the interiors were decorated. The appearance of the main building and the western wing of the palace remained practically unchanged. But from the interiors to date only two have reached - the main lobby and the Belyy Hall. At the end of the XIX century, the palace was inherited by the Grand Duchess Ekaterina Mikhailovna, the Duchess of Mecklenburg-Strelitzky, who later bequeathed it to her children. But since the heirs were German subjects, Emperor Alexander III decided to redeem the palace into the treasury, which was done, however, after his death for 4 million rubles in silver. Next, April 13, 1895, issued a decree of Nicholas II on the establishment of the "Russian Museum of the Emperor Alexander III", for the creation of which the whole complex of the Mikhailovsky Palace was transferred. In 1827, according to the decree of Emperor Nicholas I, the device began in front of the palace of the square. The project was also developed by Rossi, and gardener was engaged in the gardener Joseph Bush, who created the square in the English style: with green lawns and wide paths, along the edges of which were beds of rare bushes and flowers. Around the square was surrounded by a cast-iron grate and surrounded by a sidewalk of pudost stone. Since that time, the square has become known as Mikhailovskaya. The Mikhailovsky Theater (Iskusstv Square, 1) was conceived as a chamber stage for high-ranking guests. He opened his doors to the first spectators on November 8, 1833. The architect of the building Alexander Bryullov started construction in 1831 and tried to organically enter the theater into the already established ensemble of the square. The facade of the theater, which was given the appearance of a residential building, was designed by Carlo Rossi to harmonize with the building of the Mikhailovsky Palace. Therefore, the genuine brilliance of the Imperial Theater - silver and velvet, mirrors and crystal, painting and stucco - were only open to the public. In 1859, architect Albert Kavos reconstructed the interior layout and decoration of the theater. He increased the size of the hall, arranged the 5th tier. In the classical interiors appeared elements of baroque - stucco molding, caryatids over the proscenium. These interiors have survived to our time. Before the revolution, the Mikhailovsky Theater did not have its own company, and along with the Mariinsky and Alexandrinsky theaters was managed by the general directorate of the imperial theaters and was used as an additional stage. In 1918, at the initiative of A. Lunacharsky, a new musical theater was created - the State Mikhailovsky Theater, which first showed the old performances of the Mariinsky stage, at the same time a permanent troupe appeared in the theater. In 1822, the construction of private houses began around the perimeter of the square. Near the theater in 1831 there is a house (Iskusstv Square, 3), also created by the project of Rossi. His first master was Count Pavel Vasilievich Golenishchev-Kutuzov. An ambiguous person involved in the murder of Emperor Paul I, a brave warrior who fought Napoleon, and a tsarist official, ranked governor-general of St. Petersburg, who participated in the commission to investigate the Decembrist conspiracy. In the 1930s, a family of musician and composer Count Mikhail Vilgorsky settled in the house. Later, in 1835, the Vilhegorsky family moved to a neighboring house, and ten years later they bought a house 4, which belonged to the tobacco factory owner Zhukov. In the first half of the XIX century, the house of the Villagesky was one of the centers of the musical and creative life of the capital, Pushkin, Zhukovsky, Vyazemsky visited their salon, List, Glinka, Berlioz visited. By the way, later in the basement in the second courtyard of house 5 was the famous literary and artistic cabaret "Stray Dog", opened in 1911 by Boris Pronin, Meyerhold's assistant. After moving to Petersburg together with Meyerhold they established the Society of Intimate Theater, and "Stray Dog" was registered as a club of society. At the address: Iskusstv Square, 2, there is a school building, also built in classical style in 1938 by the architect Noah Trotsky. The school arose on the site of the Zhurbin house burned down in 1903, where one time the rich collection of the publisher of Otechestvennye zapiski Pavel Svinin was located, until financial difficulties forced him to sell his Russian Museum. Mikhailovskaya street from the square to the Nevsky Prospect was built in 1834-1835. At the same time, the corner plot of house No. 9 (on Italian Street) was handed over to the Nobility Assembly. Now in this building is the Philharmonic. The author of the house, built in 1839, is the architect Paul Jacquot, and the facade, like other facades of the square, was designed by Rossi for the Noble Assembly of St. Petersburg. The first-class acoustics room, which seats more than 1500 people, became the center of the musical life of St. Petersburg from the end of the 1840s. There were well-known musicians of the XIX century: F. List, G. Berlioz, R. Wagner, G. Mahler, A. Rubinstein, K. Schumann, P. Viardot, P. Sarasate and many others. Here, for the first time, many compositions of the classics of Russian music of Borodin, Moussorgsky, Tchaikovsky, Rimsky-Korsakov, Glazunov were performed. June 12, 1921 in this building was the grand opening of the Petrograd Philharmonic. To the right of the Russian Museum (Engineering, 4/1) is a building built in the style of Russian neoclassicism in the early 20th century specifically for the Russian Ethnographic Museum (more precisely for the former Ethnographic Department of the Russian Museum of Emperor Alexander III). The construction, which was conducted by the architect Vasily Svinin, began in 1903 and lasted until 1916, when the interior decoration of the premises was completed and the museum equipment was installed. On the other side of the square, almost opposite the Mikhailovsky Palace (Italianskaya St., 13), the building of the Musical Comedy Theater is located. Originally it was a profitable house belonging to a large businessman, an Armenian by birth, I. Lazarev (Lazarian). The building was repeatedly rebuilt and repaired until in 1896 the house was purchased for its favorite, the actress of the Alexandrinsky Theater Maria Pototskaya, Grand Duke Nikolai Nikolaevich. After a severe fire in 1910, the building was transferred to the city treasury and, according to the design of the engineers I. Balbashevsky and A. Maksimov, the internal premises were rebuilt for theatrical performances. On December 18, 1910, a theater was opened here, which was called "Dvortsovy Theater", where operettas were staged. In 1920, the building was transferred to the State Theater of Comic Opera, in 1929, the newly created Music Hall was established here, the musical part of which was headed by composer Isaak Dunaevsky. Since 1938 it houses the Leningrad Theater of Musical Comedy. Another house, determining the shape of today's square, the Grand Hotel Europe (formerly the Hotel European). The building of the hotel was built by the architect Ludwig Fontana in 1873-1875 on the basis of two houses: the former hotel Klee (where the Marquis de Custine, MI Petipa, and IS Turgenev stayed at different times) and the A.A. Rogova. In 1871, after a fire, both houses bought the joint stock company "European Hotel" and after reconstruction, on January 28, 1875, the Hotel Hotel d'Europe was opened. With a rich hotel "European" is connected one of the Petersburg legends. Some heir to the St. Petersburg millionaire who died in exile, who allegedly managed to hide gold from Russia before fleeing the floor of one of the hotel rooms, came to Leningrad in the Soviet era. He managed to settle in the same hotel room, and late at night he opened the floor, found a metal box under the parquet, reinforced with a powerful bolt. Midnight he sawed, and when the last jumper was propylene, there was a terrible roar - in the restaurant hall of the lower floor the chandelier collapsed. In the late 90s of the 20th century, the hotel began reconstruction, which ended in 2008. And already in 2009 at the World Travel Awards in London the hotel Grand Hotel Europe was named the most luxurious hotel in Europe and the world. However, among the architects there is an opinion that the reconstruction of the houses of Rogov and Klee is one of the serious town-planning mistakes that violated the symmetrical composition of Mikhailovskaya Street. After the revolution, according to the Leninist plan for monumental propaganda, a bust of the German socialist Ferdinand Lassalle was set up on Nevsky Prospekt in 1918. In this regard, in the early 1920's Mikhailovskaya Square (as well as Mikhailovskaya Street in 1918) was named after Lassalle. On September 26, 1940, Lassalle Square was renamed the Iskusstv Square. This name was given because the largest cultural institutions are located here. June 19, 1957 in the center of the Iskusstv Square was opened a monument to Alexander Sergeyevich Pushkin by Mikhail Anikushin.